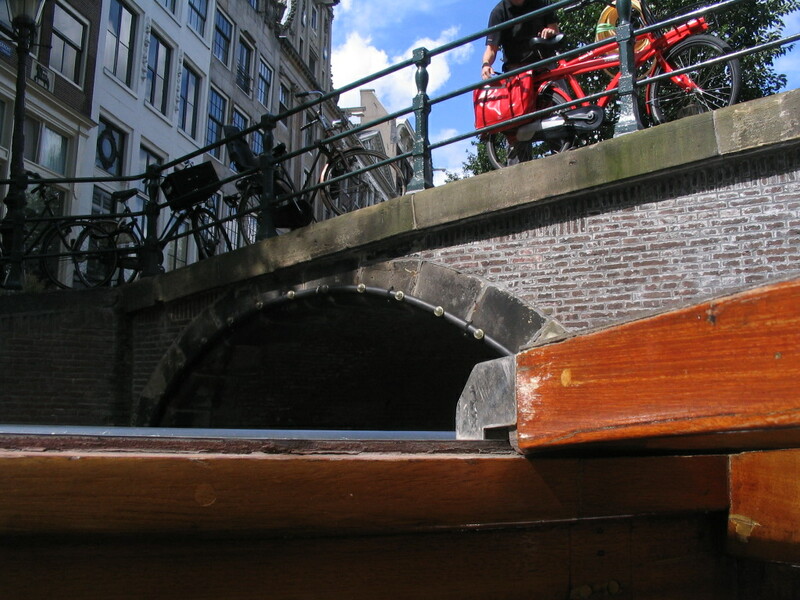 On the latter part of the tour, we threaded into the city center and onto the concentric canals, i.e. the Grachtengordel (Canal Belt) that I'd already walked by extensively. 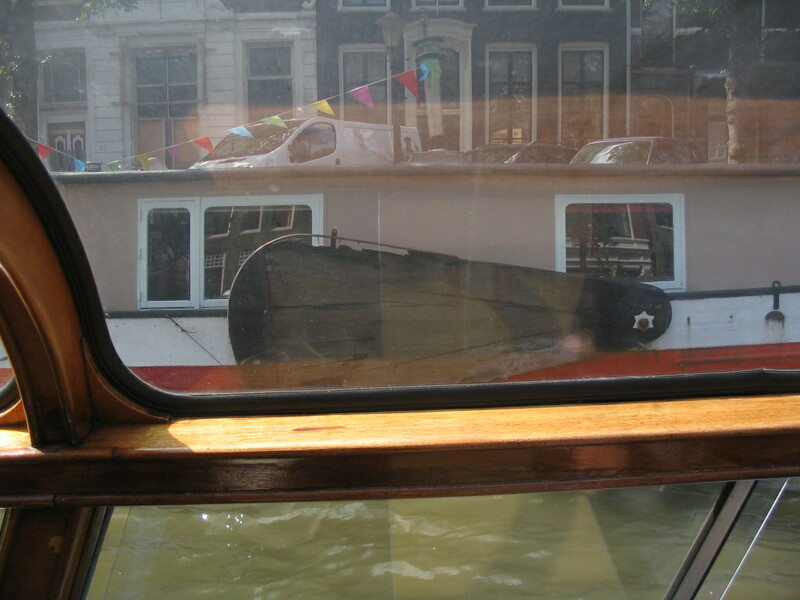 It was intriguing to get another, interlaced perspective on those parts from the canals themselves. A neat old defense tower, Montelbaanstoren, looking northeast on the Oudeschans canal toward NEMO, which you can espy low in the distance. 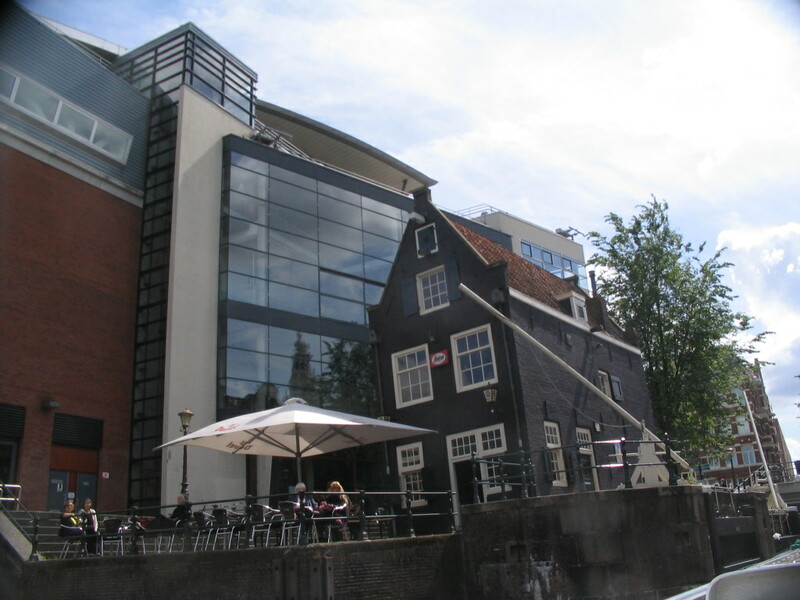 By the Oudeschans just before Sint Antoniesluis (St. Anthony's Sluice), a divergence of scale: the house contains Cafe De Sluyswacht, so I bet it's the old guardhouse for the sluice, while the big building appears to be Amsterdamse Hogeschool voor de Kunsten (Amsterdam School of the Arts). The side of the house has some serious masonry tiebacks. 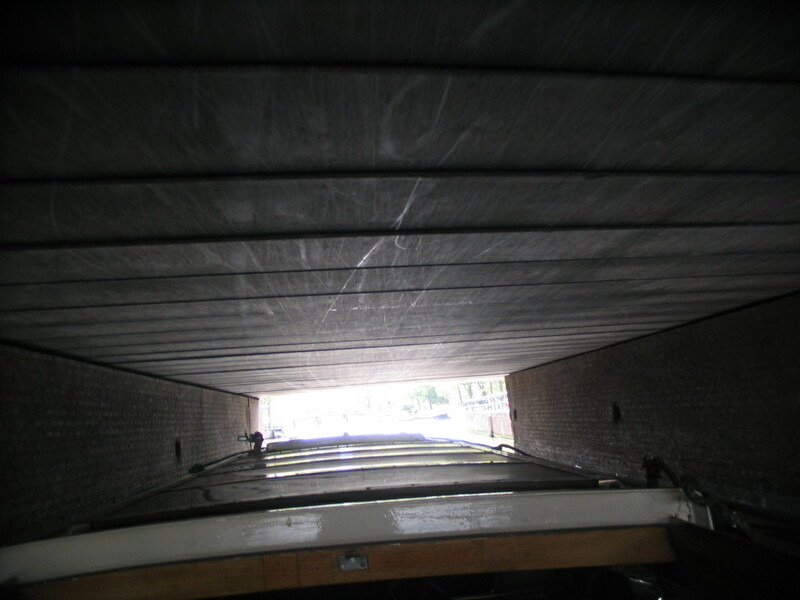 Tunneling through Sint Antoniesluis/under Jodenbreestraat. 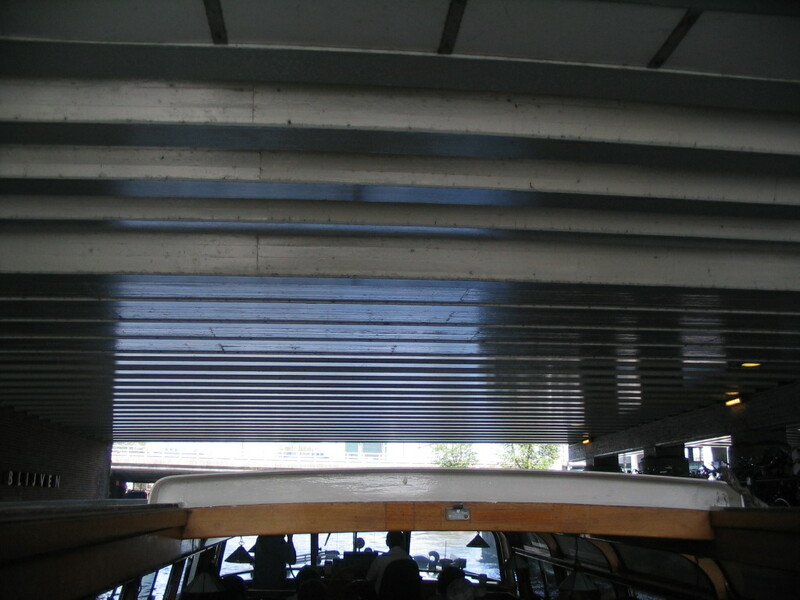 Now on the Amstel, heading south under Blauwbrug. 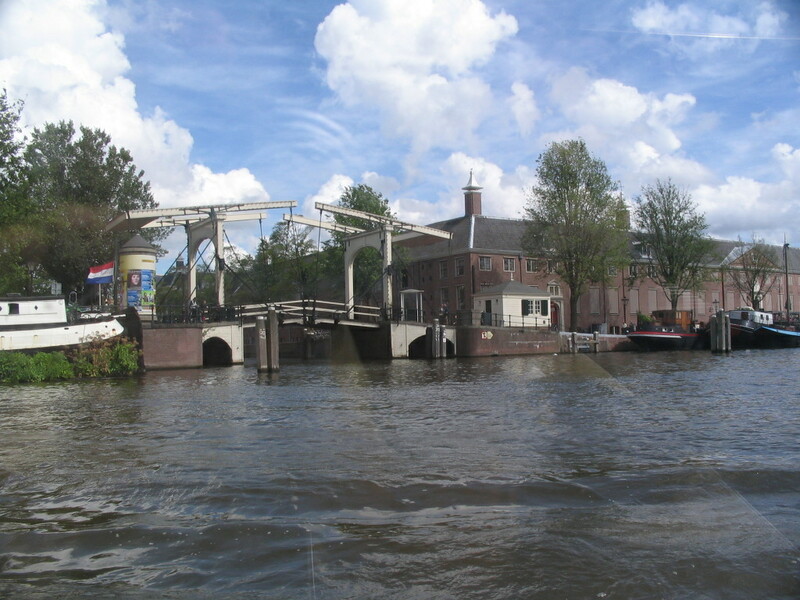 Here's one of those cool drawbridges again, crossing the Nieuwe Herengracht. 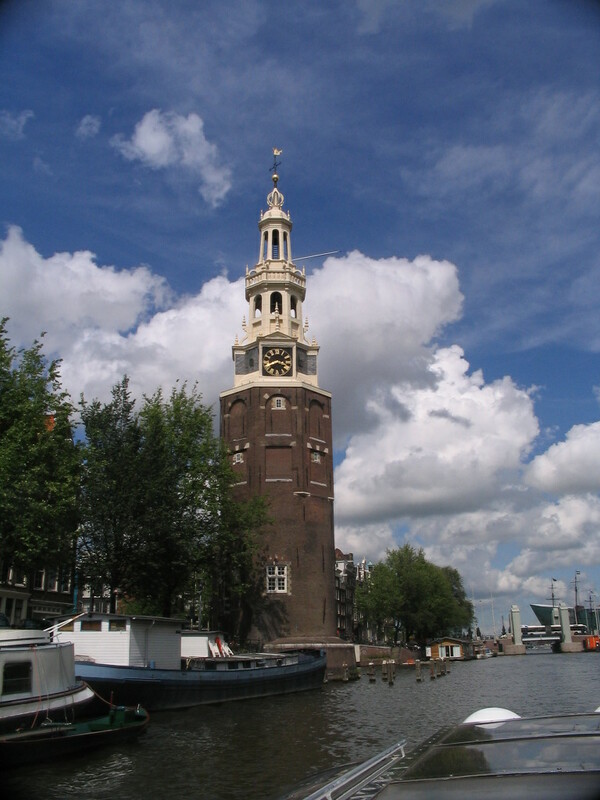 The building beyond is the Hermitage Amsterdam. 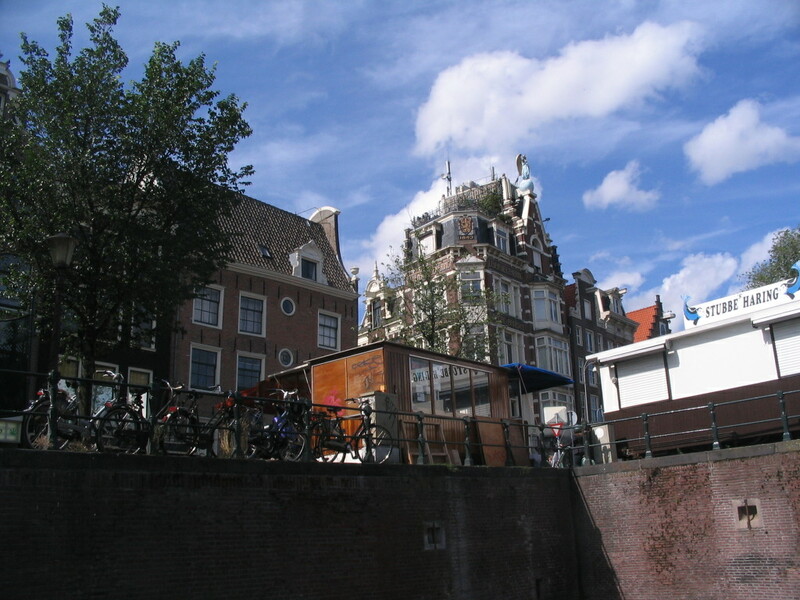 Now into the Canal Belt, on the northeast side of the Herengracht at the corner of Koningsplein. I haven't been able to locate this exactly. 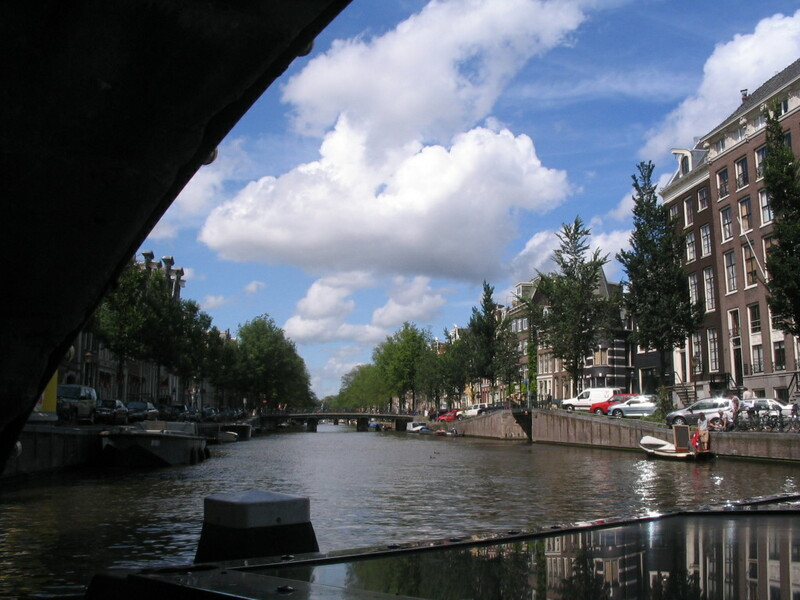 Maybe turning from the Herengracht onto the Leidsegracht? Maybe looking north on Keizersgracht? We report, you decide. Lots of bridge and bike views. 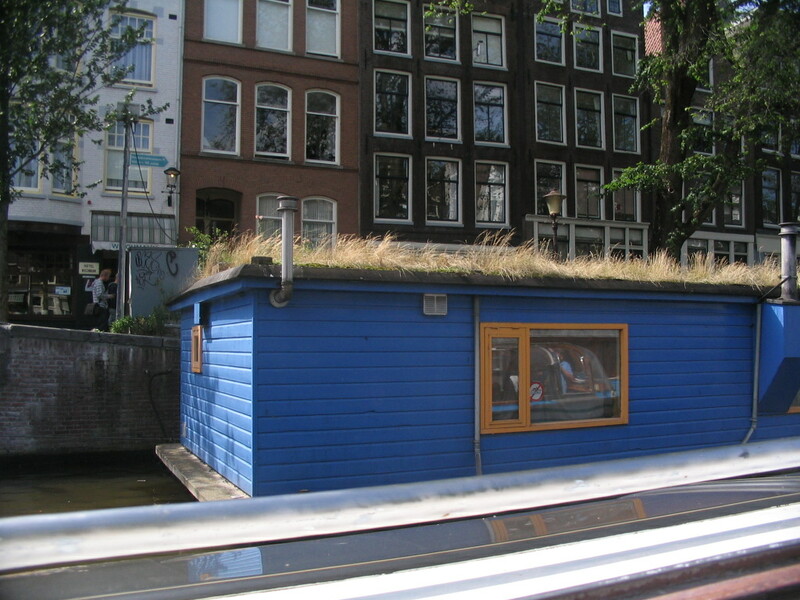 Green roof houseboat! 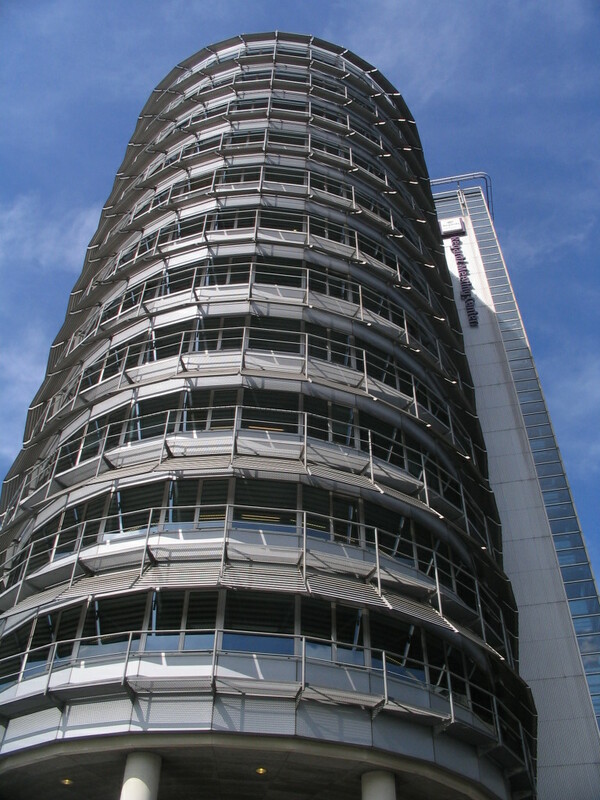 This is on the west side of the Prinsengracht just north of Runstraat. 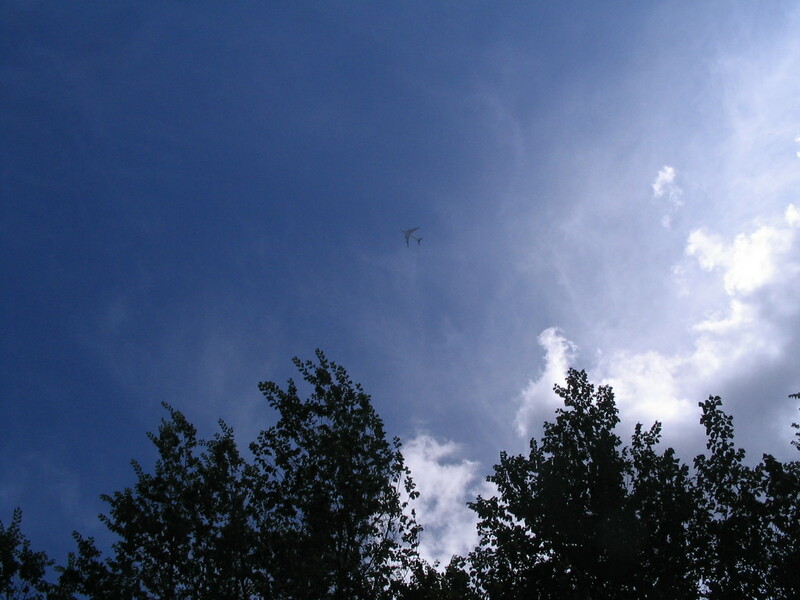 We were proceeding clockwise around the city on the canal. 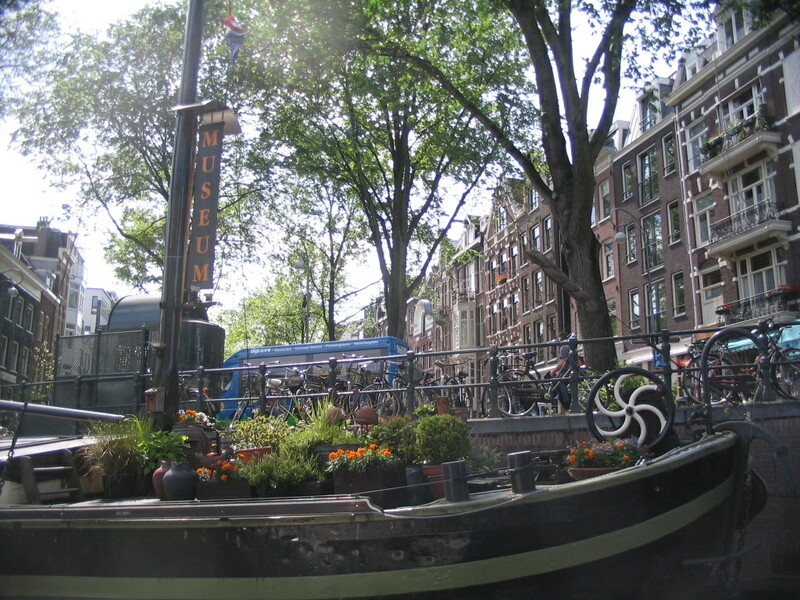 A lovely houseboat-garden, and just beyond it, a look down the Elandsgracht from the Prinsengracht. 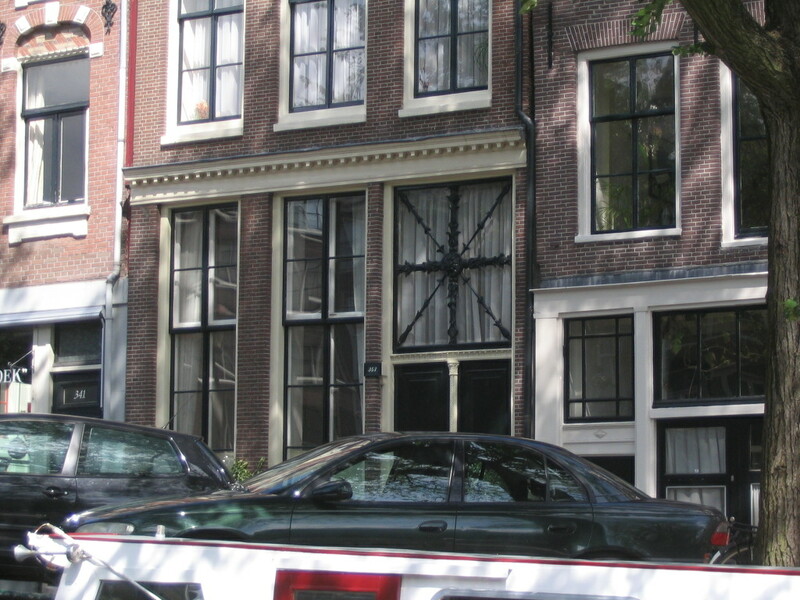 Some neato wrought iron on the east side of the Prinsengracht just south of Reestraat. 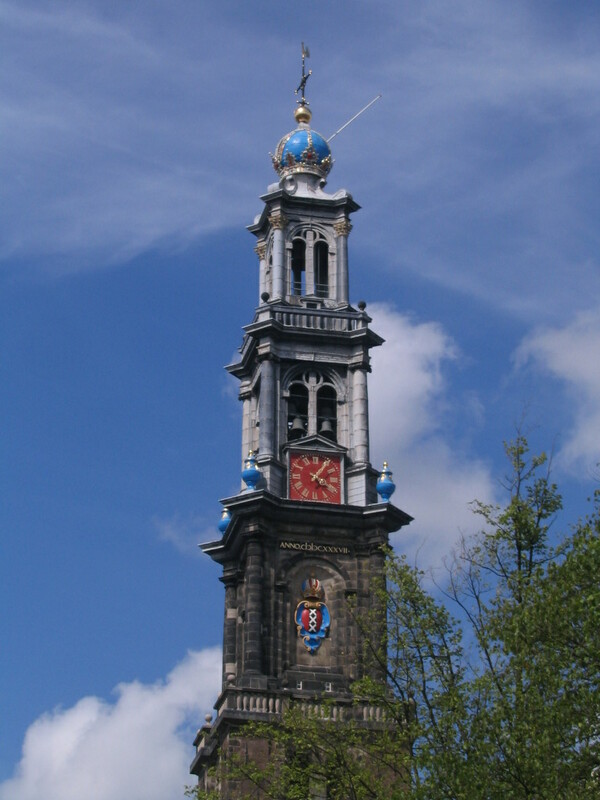 This nicely color-coordinated spire belongs to the early-17th-century Westerkerk, on Westermarkt along... the Prinsengracht! 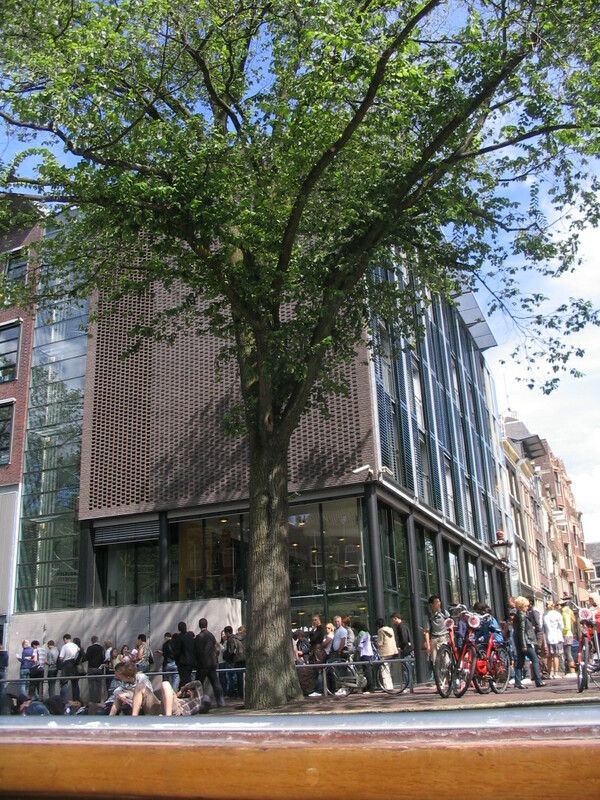 Just on the north side of Westermarkt is the Anne Frank Huis, the museum at the actual location where she hid during the war. As at Verkatehdas, a nice use of brick openwork. A bifocal view as we headed under the west Herengracht bridge from the Leliegracht, whence we turned left onto the Herengracht. 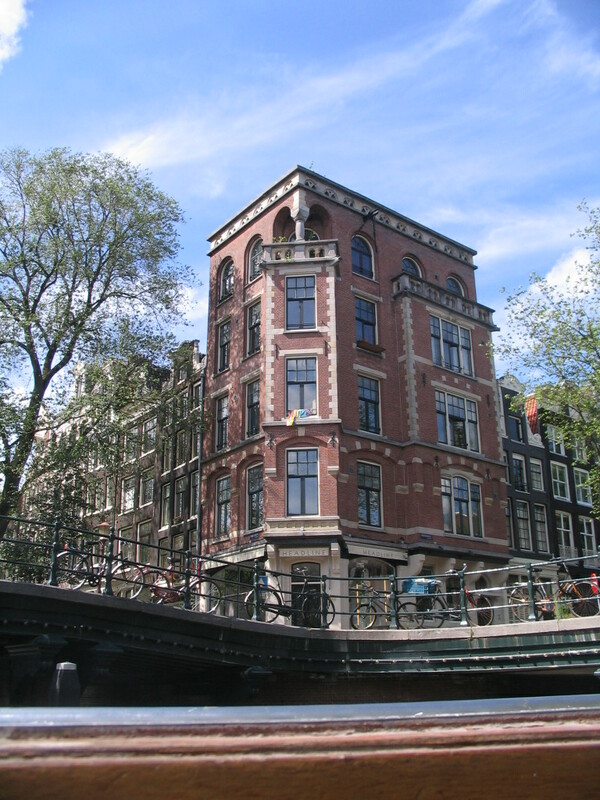 I detect, possibly faultily, a hint of Spain in the upper arches of this building standing on the northern corner of the Herengracht and the Leliegracht. 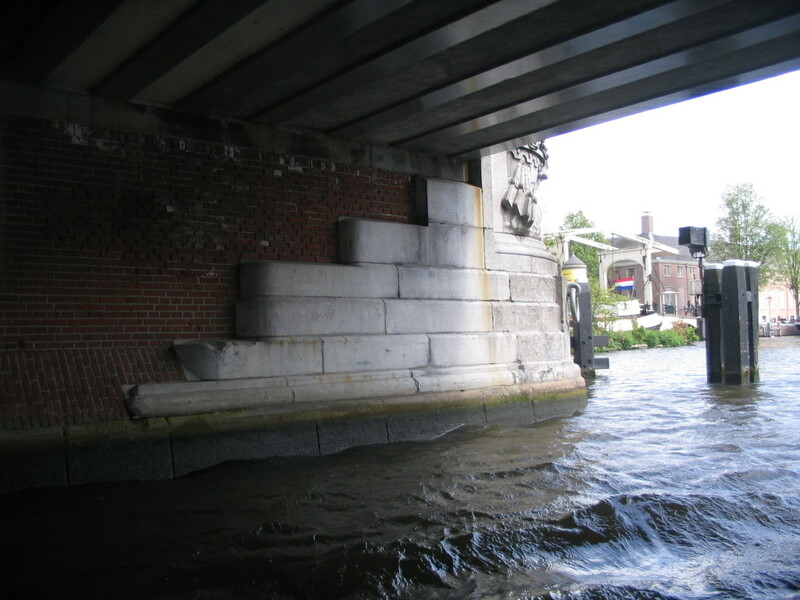 Sliding under the Herenstraat bridge — note the barely visible 18 in the keystone — can anyone tell me what it means? 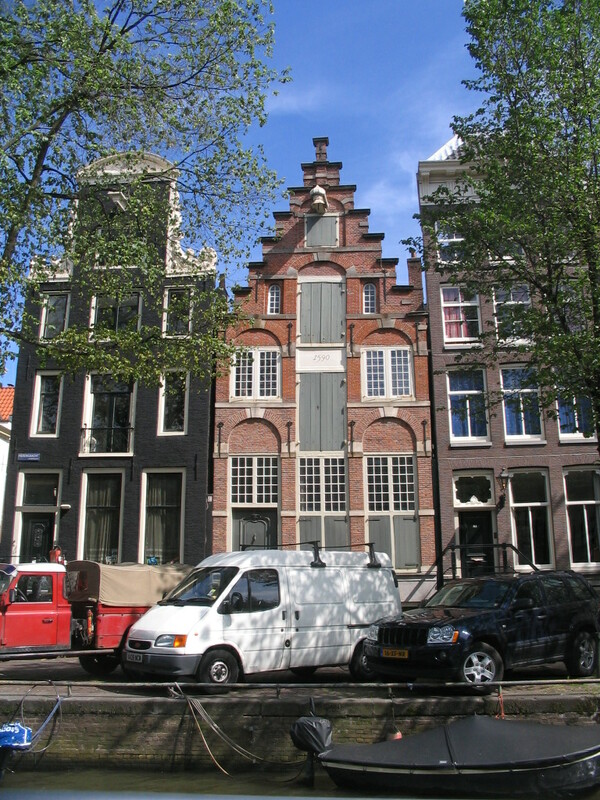 I love this stepped-gable house on the southern corner of the Herengracht and Korsjespoortsteeg; at a glance there seems to be a smooth gradient from large to small elements as you go up, caused by the combination of the decreasing window and door sizes plus the extra-narrow crowning step. Note the "1590" on the white panel between the upper doors. 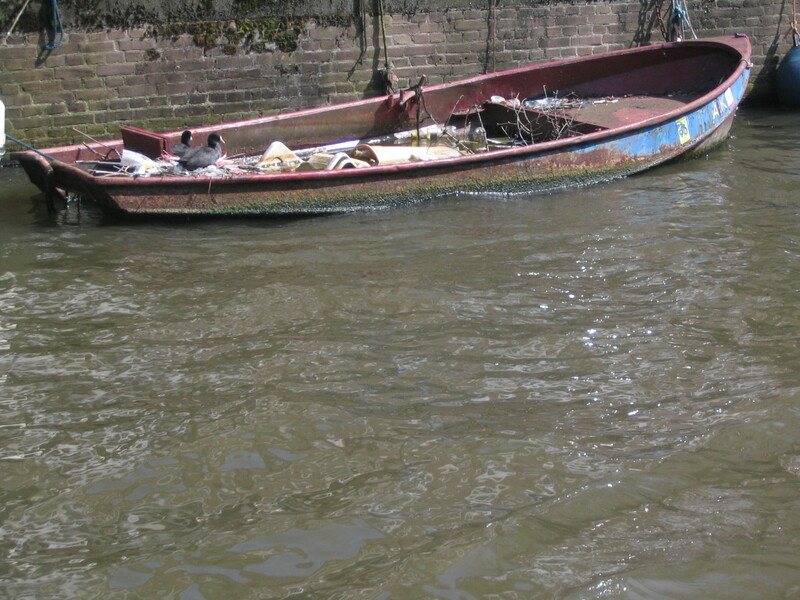 Even the coots love boating on the canals. 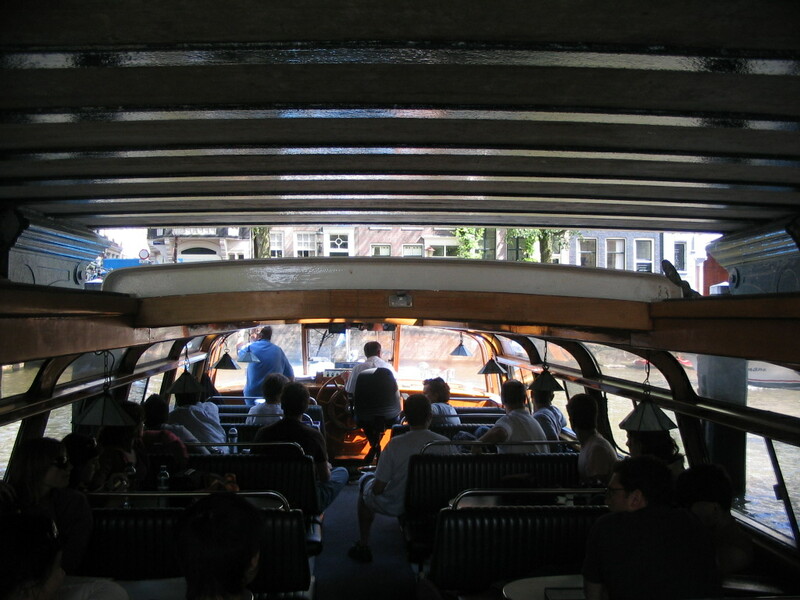 I wish I could remember what the tour guide told us about the houseboats on the canals. 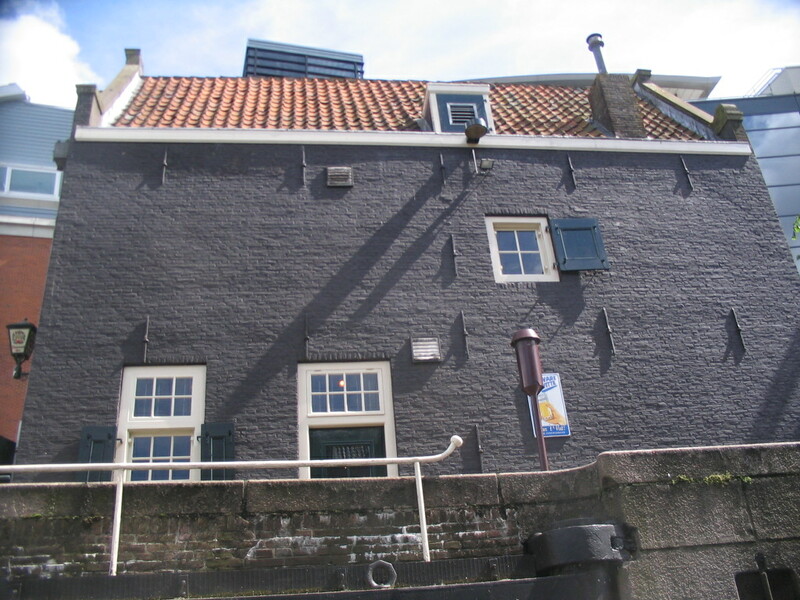 Anyway, this one was on the Herengracht across from Roomolenstraat, just south of the Brouwersgracht, and it holds what appears to be the blade of a whale-size ship's propeller. 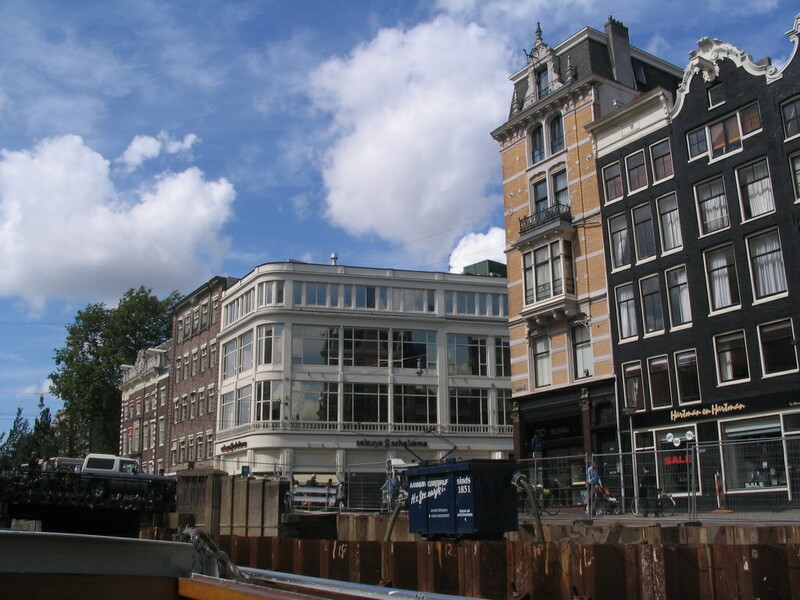 We turned right onto the Brouwersgracht (Brewers' Canal), which is the northwestern terminus of the Herengracht and the Keizersgracht, and then turned left onto the Singel. Here we are at the Singel and Haarlemmerstraat, looking north; the hard-to-read date on the fancy building of accreted volumes is 1843. 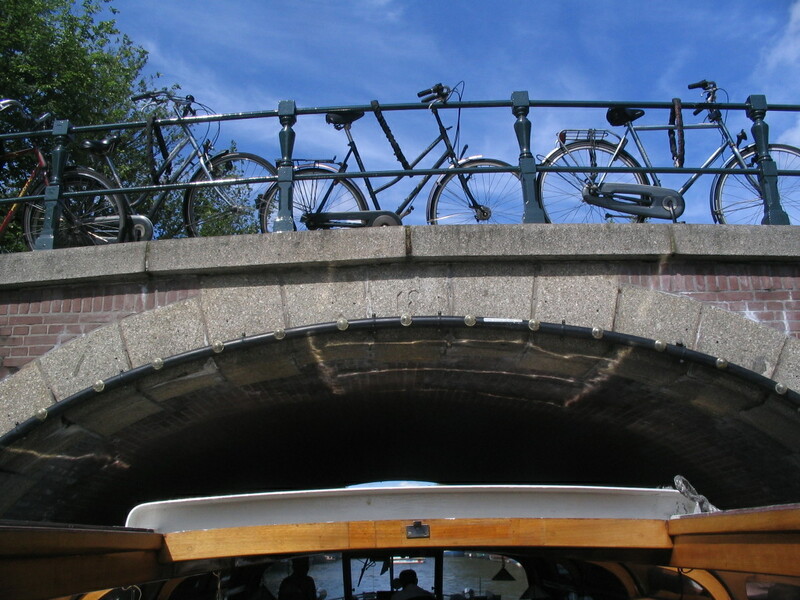 The cycle was almost complete — we just had to get under Prins Hendrikkade here to get back to the start in Open Haven. 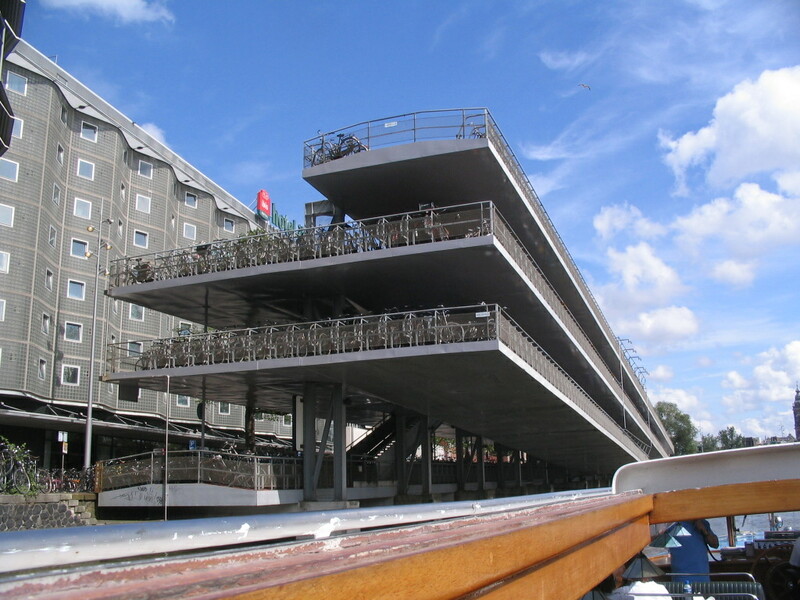 By Open Haven just west of the Centraal Station, there's this striking bike garage, the Fietsflat, that's as big as a cars garage. At the northwestwern end of the bike garage is this tower with an intense quantity of shades.